I haven’t looked to see what is on the list of suggested ‘E’ blogs yet because while I was sitting going through the E possibilities…… elephants, entities, earth, environment, my mind became fixed on…………. I don’t know where or when I first became aware of eggs in shamanic healing but I do remember very clearly how disappointed I was when I read ‘Two Hearts in Tuva’ by Wendy Taylor, not by the book which I really enjoyed, but by the fact that the author mentioned eggs being used in a healing but failed to give any indication as to how they were used. Somehow I had acquired an idea about what to do with eggs but not the full picture. This is not at all unusual for me as almost all of my shamanic teaching has come from my own guides. Most of the time I love it this way but it can also be very frustrating. Like most guides they can be oh so guilty of drip feeding me information. I am taught what I need at the time and if that is only part of something so be it. This is how it was with eggs. From somewhere I knew that a shamanic healer could use eggs in their healing by running or rolling the eggs over the clients body. This though was as far as my knowledge went. I had no idea at all what you did with them after that. Last year when the time was obviously right, I finally found out. Eggs have long been used in healing by curanderos or healers in South America. Known as Egg Cleansing or La Limpia, it has the outer appearance of a magic or party trick but in reality can provide powerful healing. Initially the egg is used as a form of divination or seeing. The curandero rolls the raw egg carefully over the whole body of the client. This egg is then broken into a glass of water. The work of the curandero is then to ‘read’ the egg. The way the white of the egg moves in the water, the shape and form of it, how it flows, how it clings to the egg yolk, if it forms clumps, if there are coloured areas and so on, all provide the curandero with information about the state of the client’s health, problems, imbalances and where healing is needed. Once a ‘diagnosis’ has been made then the healing takes place using a second raw egg. If a particular area of the body has been identified as having a problem e.g the kidneys, then the new egg is used to collect the ‘disease’ or imbalance. This is done by rolling the egg over this point until it is deemed to have collected the energy of the disease within it. Some curanderos will also use smoke to assist this, others will blow the disease into the egg but with all of these ways the egg becomes the receptacle. The egg can also be rolled over the whole body to collect any stress, toxins or misplaced energy within it. The important thing is to keep the egg in constant motion. In a lot of shamanic healing anything that is removed from a client is held in a receptacle and then given to the earth or an ally in nature to be transformed. This also happens with the egg. As soon as possible the egg is taken outside and buried deeply in the earth in a place where animals can’t dig it up to eat. Some curanderos will burn the egg instead of burying it. Sometimes the ceremony or ritual is made more complex by the use of candles through which the egg is run initially or by the use of chants, prayers or incantations. The actual healing though needs none of these, just two raw eggs, a glass of water and a healer with the experience and skill to be able to ‘read’ the information accurately. Do you ever have days when you wonder what is going on? Last night a young hare set off the security light over our porch and was so close to the house we could have reached out and touched it, had the window not been in the way that is. This followed my completing a watercolour painting of hares earlier in the day. We do have hare in the garden sometimes but usually adult ones exploring or shadow boxing further down the garden and well away from the house, never sitting on our porch. Then today around lunchtime we were in the conservatory when a kestrel flew down and perched on the back of a garden chair a few feet from where we were sitting. Again we do have kestrel around sometimes, we see them flying, sitting on the telephone wires or dropping into fields but never so close to the house. I’m going to watch now and see what else happens. I could rush to the internet to look up the symbolism of hare and kestrel but that will be someone else’s meaning, not mine, and so I will let this sit, for now anyway. One thing I do know is this has been two days of absolute magic. Rachel Patterson has distilled the essence of everything connected with the moon into this wonderful and charming book. Moon phases, rituals, recipes, meditations, deities, power animals, signs, symbols, charms, spells, divination and so much more are tucked carefully within its pages and through it all shines the authors love of working with the moon and moon magic. A delight for everyone who gazes upon the moon and wonders how to work with its immense power. 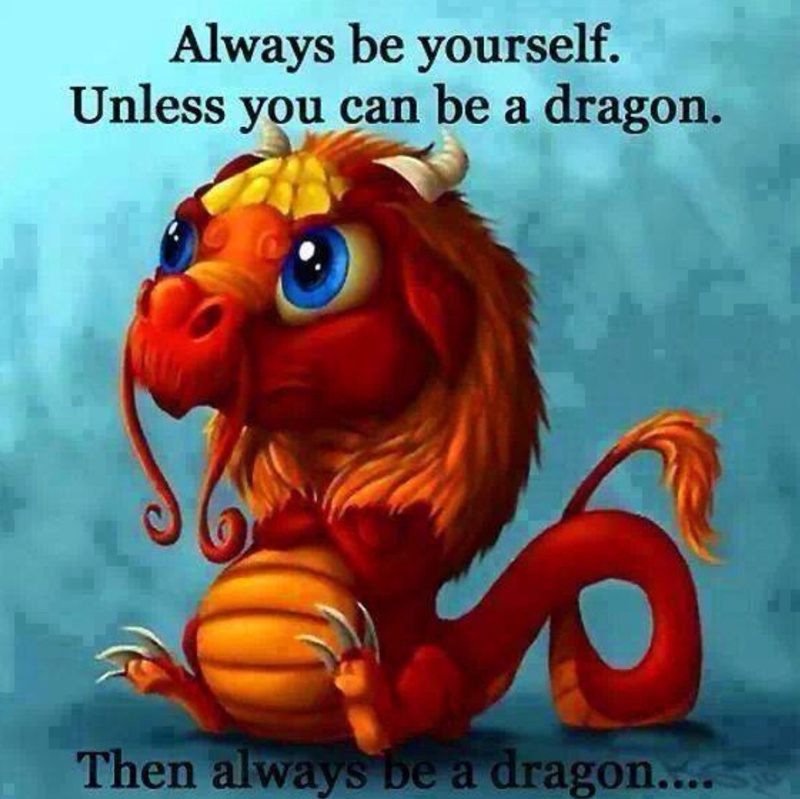 I have always loved dragons, for me they are magical beings who can breathe fire and fly. How could I not love them? One of my favourite films, one of the few films I can watch over and over again and never tire of is ‘How to Train Your Dragon’ which for me sums up how misunderstood dragons are. When I began working with energy, learning the importance of grounding myself with Earth energy, I would always find a sleeping dragon, deep in the Earth’s centre surrounded by stones and crystals. As I gained in experience the dragon awoke. I would see one eye watching me lazily but never did I feel afraid. This then progressed to me being able to sit up on the dragon where it would wrap its leg gently around me and I realised then that the dragon was there to protect me and I still think of them in this way. Eventually I stopped seeing the dragon there, I suppose I didn’t need it in the same way. I then would have so many images of dragons in my head that the only thing to do was to draw them to get them out. They left me alone then for a few years but out of the blue I started dreaming of them again. On a course a few weeks later another participant spoke of dreaming of dragons and the messages he had been receiving. He gave us all a river stone and asked that we return it to the Earth as they represented the dragon’s eggs which had been lost over time, he explained that the Earth needed them back. I brought mine home with me and buried in a special place where only I know of its existence. Until I began writing this I had forgotten all about the river stone and the dragon’s eggs but now I remember it feels like time to visit it again, not to dig it up but to reconnect with it in some way. The drums used in shamanism are usually hand drums which are reasonably light and can be held in one hand. They have wooden frames with animal skin stretched tightly over one or both sides of it depending on the style of drum. 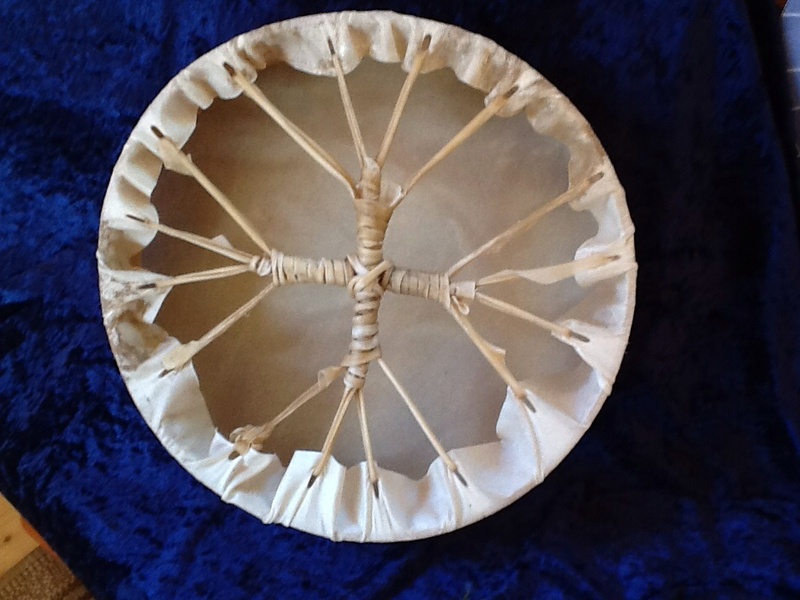 The back of the drum is often laced with sinew or hide to form a web of eight strips representing the Cardinal and Non Cardinal directions, the eight spokes of the medicine wheel, the eight legs of the mythical horse Sleipner which carried the Norse Shaman Odin to Otherworld and the eight legs of the spider. The middle of the lacing is tied to form a handle and this takes the shape of a cross. The skin can be left plain or decorated in order to reflect the personal medicine of the person it is working with. Anything that is added to a drum brings in the energy or medicine of that which it represents incorporating its energy into the drum. For example the surface of a drum may be painted with an animal, often a power or totem animal or spirit guide, or symbols that have meaning for the person, feathers may be tied to the lacing or the drum stick, crystals, stones or a medicine pouch may be attached to the drum. Therefore a drum with a frame of cedar, covered in deerskin, painted with a wolf and with eagle feathers tied to the lacing would contain the energy or medicine of all of these. The drum is a powerful tool for healing, just sitting and playing a drum can heal us for the beat of a drum is recognised by our beings for it is the closest sound to our own heartbeat. Drumming with a steady, regular beat can be great for relieving stress and when we are ungrounded sitting on our own and drumming in a regular rhythm can help to ground us. Drumming also has a powerful effect on our emotions and feelings, it can relieve anger, help us find courage and clam and centre us. 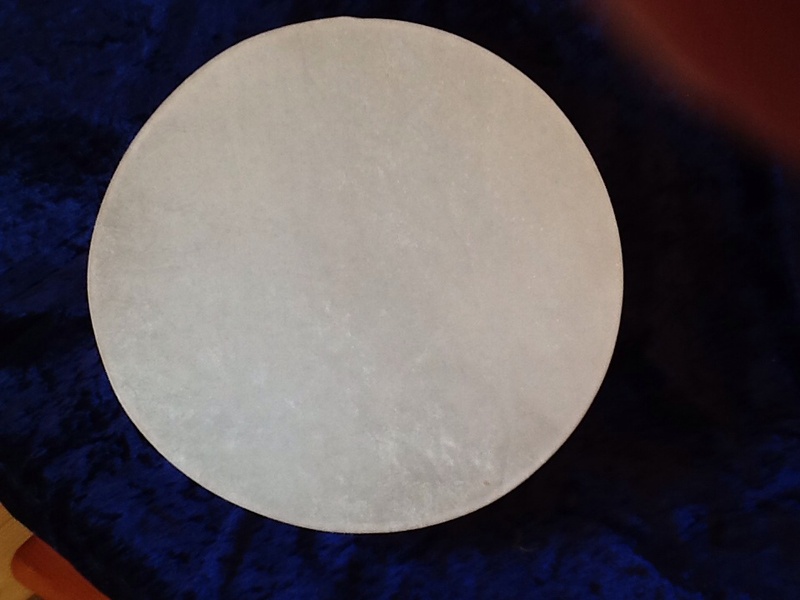 If we drum over our heart it can help heal and release emotions of the heart whereas drumming over or next to the solar plexus is excellent for releasing fear. A lovely way to drum for yourself is to carry out a Rainbow Drumming where we drum the organs of the body and also much of our endocrine system or the areas of our body that hold our energy centres or chakras if that is within our belief system. Begin by holding the drum at the front of your body, low down in the space where your legs meet your torso, drum for as long as feels right. Move the drum up around your naval and again drum for as long as feels right. Finally move the drum and hold it over your crown and again drum for as long as feels right. You may find that the beat and tone of the drum will change as you move positions. This is good as it is responding to your energy, emotions and needs. 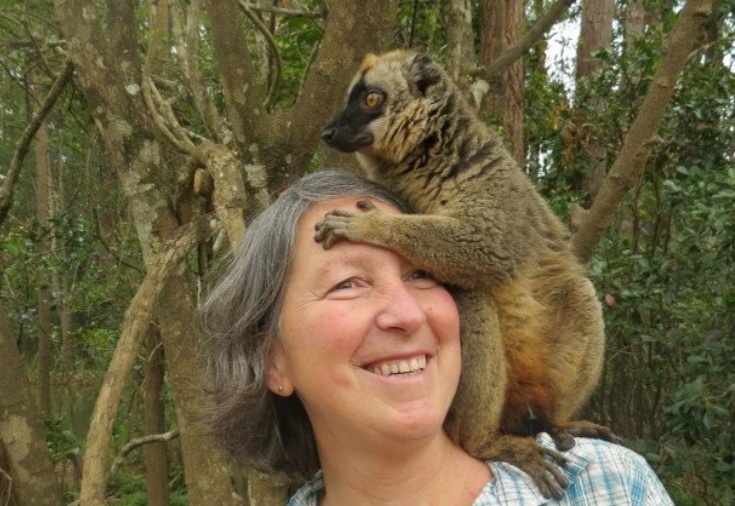 Whilst on holiday in Madagascar I was fortunate enough to meet the local Witchdoctor. It had been explained earlier that the Witchdoctor was the sole source of order and justice within the area and that much of his work was to act as an arbitrator between people. I had been told that the Witchdoctor worked with seeds that he shook and placed in a matrix of columns labeled with things like home, relationships etc and that the spread of the seeds provided the answers. This way the Witchdoctor could say it was the word of spirit and thus pass on his wisdom without becoming part of the decision. When the Witchdoctor arrived, apologising for being late, we settled into a private area to talk. I now know what an international meeting must feel like for every question and answer had to be translated from English to French, French to Malagasy and vice versa. It was a very long meeting! The Witchdoctor was still relatively young, for a Witchdoctor anyway, and I asked how he had become a Witchdoctor. He said that at the age of 13 had become interested in the work of the village Witchdoctor and had asked to learn. He was then taught until the time came for him to take over. I asked him if there was ever anyone he couldn’t treat and was told that he would always try to help but if he couldn’t there were others he could go to for advice. Very similar to me referring a client when I knew that someone could do more for them, or asking my guides for help if referral was not possible. Throughout our time together the Witchdoctor and I shared explanations of how we worked. He told me that he worked with the spirits of his ancestors and so understood immediately when I said that I too worked with spirit helpers although not those of my blood ancestors. We also discovered that we both used plants in our healing and as we shared we found more and more similarities in our ways of working. At one point the Witchdoctor seemed puzzled and it was explained to me that he knew he did Malagasy magic but he couldn’t understand that what I did was also Malagasy magic, but that I wasn’t Malagasy. The Witchdoctor had kindly brought with him what he referred to as his artefacts and which we might call our tools and much to my surprise he allowed me to handle them as he explained their purpose. He showed me the sikeli, the tiny black seeds, that he scatters to find the answers to problems, the healing needed or the advice sought as well as a large hard, leathery seed shaped like a tongue which he uses to speak to his ancestors. Amongst the artefacts was a crocodile’s tooth and he explained that this gave him strength. In much the same way that we might call on our own power animals he would call upon the strength of the crocodile. There was also a piece of crystal that he used to give him clear sight and a small shell that provided protection for extraction work. He was very amused by the fact that I use black tourmaline for this, a stone he knows but which serves no role in his healing work. Whenever I travel I always pack a couple of pendulums as I usually meet someone to whom I am able to gift one. Here I was once again, in a strange country with a need to gift a tool that might be useful, therefore it was one of the ways I work with a pendulum that I chose to share more with the Witchdoctor. Initially I asked if any of the translators present had any pain and was told no, but that the Witchdoctor did. I asked which area of his body this pain was in and hands were vaguely waved over his lower body/legs. I asked if it was his knees and was again shown the vague area so I asked permission to work. This was given and so holding the pendulum over his right knee, the area I had been drawn to I asked it to show me the site of the pain. Straight away it swung and it was wonderful to see the look of amazement on the Witchdoctor’s face as the problem was found straight away. He then explained that he had pain in his knee and that had been why he had been late. As I could feel energy flowing I then asked if it was alright for me to continue working. I wasn’t sure if it would be culturally acceptable to use my hands directly and as I was still holding the pendulum allowed the energy to flow through it, focusing it into the area identified until the energy stopped flowing. I then explained that I would like to give the pendulum to the Witchdoctor in thanks for his sharing his work and artefacts with me. At this point we observed the Malagasy tradition of thanking each other profusely and parted company each having learnt from the other. The next day I was told that after I had left the Witchdoctor had been saying how impressed he was with me. He had walked from the room, to reception saying ‘No pain, no pain’. The Druid Shaman, as the title may suggest, looks at shamanism from a specifically Druid perspective, and its place as the ancestral shamanism of Britain and Europe. The book begins with an introduction to the Celts, Druids, what a shaman is and a look at the shamanic tale of Taliesin. Practical Druidic shamanic tools are shared, along with the very important basic tools of how to raise your own energy and power and how to create sacred space. The importance of the world tree and the need for balance reoccurs throughout the book. Whilst there is no attempt by the author to teach shamanic journeying, through a series of guided meditations/pathworking exercises the reader is gently encouraged to learn to make contact with their own Druid guides and indeed the very Earth itself. I have worked with Shamanism for a number of years and as such it was fascinating to read Forest Danu’s Druid Shamanism whilst comparing and contrasting it to my own form. Of particular interest to me was the section on divination and as with other areas of shamanism, it was interesting to read about divination from a Druid perspective. As someone who has recently become a student of the OBOD I also enjoyed her explanations of some of the myths, legends and figures that accompany Druidry. This is a well researched book, written by someone who clearly has both the theoretical knowledge and practical experience. The book is also well referenced and has a good reading list for follow up reading. I would highly recommend Druid Shamanism to anyone with any interest in Shamanism in general and in particular Celtic and Druid Shamanism.